It comforts me to see you, though when I cannot feel you I get scared. Why is it that you friend, are the one with the words I NEED to hear? Seeing you brings me comfort, but to feel your presence, is all I need. I can see you even from the other side of the world, All I have to do is close my eyes and your right here inside me. Please move closer. I can't see you at all right now. If only you can see me standing next to you. That image is John Marston from Red Dead Redemption? The photographer took a blurred picture of a video game? 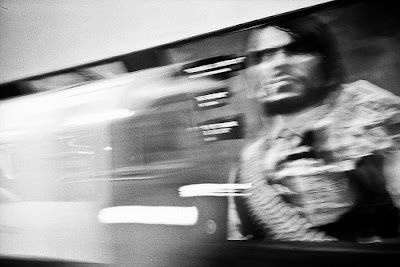 Jon, the photographer took a picture of a billboard in a subway that happened to be for the game Red Dead Redemption. It's not the video game itself, no. If you go back through the entries, you'll notice that Jon occasionally will snap edges/parts of the comercial installations that we share our public space with. I personally really enjoyed Red Dead Redemption but Jon, however, doesn't play video games.